Al Lamb’s Dallas Honda - Whether you’re looking for a good time, an economical engine or a showy cruiser, the Rebel 250 is the bike you need – now. 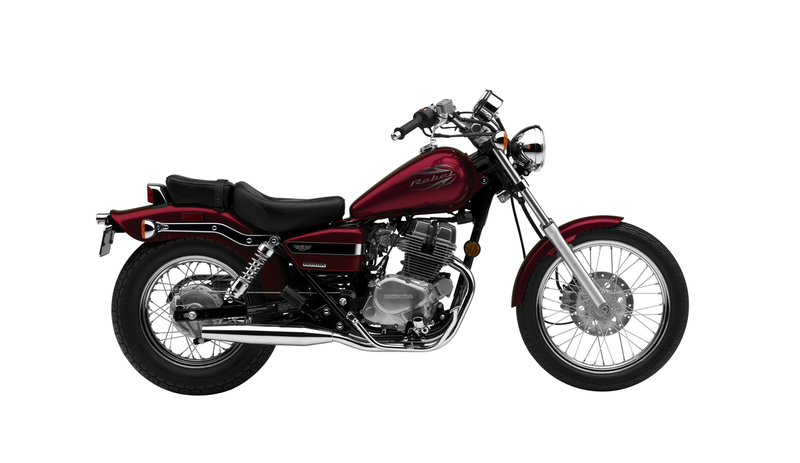 The cruiser motorcycle boasts a 234cc four-stroke engine that’s comfortable for the new rider, yet packs plenty of power for experienced motorcyclists. The CMX250C is equipped with comfortable, showy low seating, a precise, smooth transmission, and an electric starter for those quick exits. All of this, without losing any of the reliability and lasting performance of a Honda—all at a shockingly low price to boot. No wonder the Rebel has long revered as a “top notch” ride. Smooth, quiet and fuel-efficient, the 234cc SOHC engine packs a proven four-stroke powerplant and three-valve cylinder-head design, while the automatic cam-chain tensioner and solid-state CD ignition are both maintenance-free. The constant-velocity (CV) carburetor gives excellent throttle response and helps contribute to the CMX250C’s awesome fuel economy. The cruiser motorcycle also provides a reliable push-button electric starter to make getting underway a snap. Honda designed the Rebel 250 with the rider in mind, including an extremely low seat height to help you put both feet flat on the ground during stops. Custom-styled, chrome-plated headlight, taillight and turn signal casings add sleek accents to the custom motorcycle. Pullback handlebar, teardrop fuel tank, two-piece custom seat and bobbed fenders round out the classic look. With this kind of style, comfort, handling and performance, you know this is the cruiser that belongs in your garage and out on your next adventure. Miles Per Gallon - 84 mpg--Miles per gallon values are calculated estimates of fuel consumed during laboratory exhaust emissions tests specified by the EPA, not during on road riding. Use for comparison purposes only.